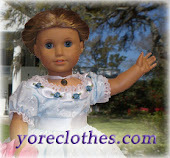 YoreClothes: Our very first 1950's design! Our brand new 'Juli Lynne' Outfit is my first 1950's design! I've had a poodle skirt in the works for about a year now, and I've finally had the chance to make it! It's just too adorable, and if it turns out to be popular, then maybe there will be a 1950's section in the future, just as my Tudor section came from my Renaissance. The history behind the iconic 'Poodle Skirt' is fascinating to me. It's a story of one woman who had an idea, and turned her idea into an industry, and that idea became the icon of an era. Read about it on the product page!